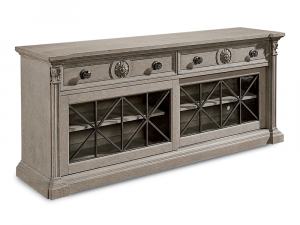 Timeless and elegant, crafted of cast resin and wrought iron. Berkley’s table aprons feature a rope twist design bordering an egg and dart design. Fluted tapered legs are finished with decorative floral pucks resting under 10mm glass tops. Entire collection is finished in subtle gold with dark burnishing. Available to order in-store. Finish only as shown. 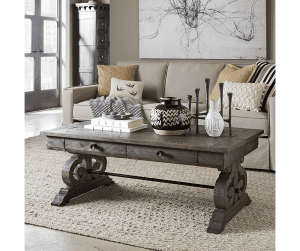 Round End Table SKU 900634. Shimmers in the day and in the night. 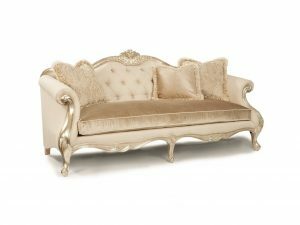 Fantastic, irresistibly sparkling sofa in a melange of shimmer latte fabric combinations that add drama wherever it goes. Pillows included. Features down cushion seating for lasting comfort. Fabrics and finish only as shown. Beautifully shaped exposed wood frame. Comfortable down blend seat cushions. Includes five elegant down blend-filled toss pillows in coordinating fabrics and trim, and a silky kidney pillow. 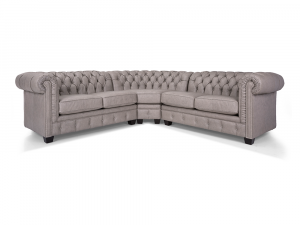 Tufted, tailored and luxurious. 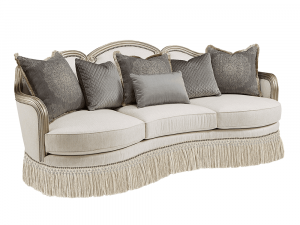 This fantastic and glamorous sofa is also available as a loveseat, chair 1/2, and multiple sectional configurations. Hundreds of custom leather and fabric options at your fingertips in-store. 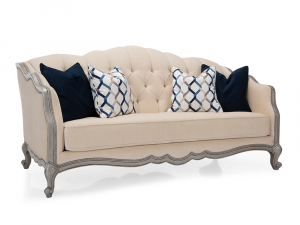 Alternate leg finishes and nailhead detailing available, even glass buttons for a more transitional look. A highly sociable collection. 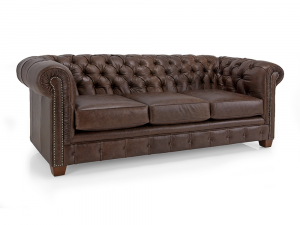 Sofa shown here as displayed in-store in decadent deep brown leather. 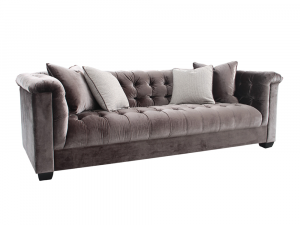 Tufted, tailored and luxurious. 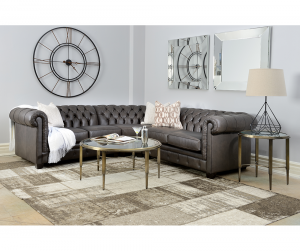 This fantastic and glamorous sectional is also available as a loveseat, chair 1/2, and in multiple sectional configurations. 3pc. Sectional on display in-store in white fabric with two one-arm loveseats and wedge. As advertised pricing applicable online and in-store for a limited time or while quantities last! A timeless classic, this exquisite, velvet sofa is a statement piece that captures the eye and provides a radiant glow to any room you place it. Features a tufted back and bench seat. Upholstered in supple charcoal velvet fabric. Includes four down-blend toss pillows. Fabric, pillows and finish only as shown. 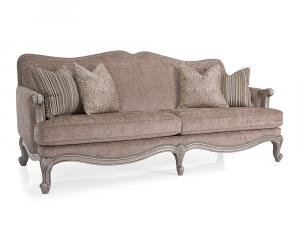 Refined and sophisticated, this classically inspired sofa effortlessly brings modern elegance to any room you place it. 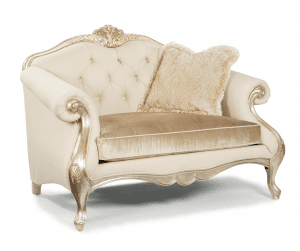 Upholstered in a luxurious Ivory fabric. Cushions are constructed with 2lb. super-soft core foam. 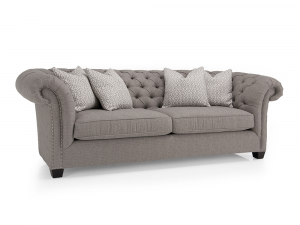 Features nailheads in small pewter and a button tufted back. 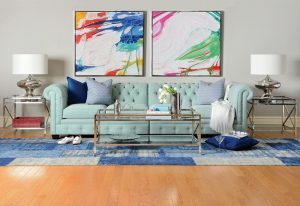 Includes 4 toss pillows in 2 shades of blue. 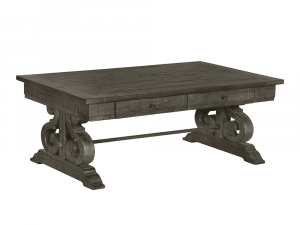 Available to order with fruitwood, espresso, black, antique grey or cream finish at no additional cost. Alternate nailheads in antique brass, brass, graphite, gold or nickel. Available to order as a Love Seat and as a Chair And A Half. Alternate gr. 23 fabrics available free of charge. +$50 per additional grade level. 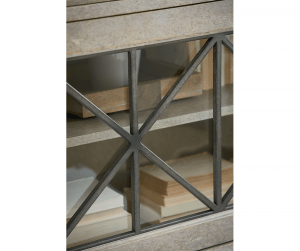 Sliding glass doors with a metal X motif. Two drawers with carved bellflower medallions. 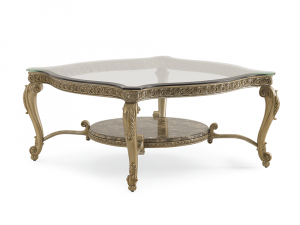 Serenity and elegance come together in this spectacular cocktail table. 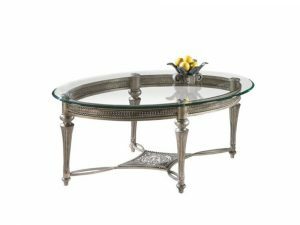 Featuring smooth curves and intricate carvings, the table lends sophistication and distinction to any room you place it. Fitted with a shaped clear glass top. Round marble Shelf below top. 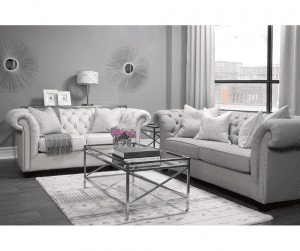 Modern chic comes easy with the addition of this elegant sofa to your home. Includes 2 Toss Pillows in Grey and 2 Toss Pillows in Graphite. Available to custom order in alternate fabrics and fabric grades. Alternate nailheads available to order in Antique Brass, Brass, Graphite, Gold or Nickel. Also available as a Loveseat or Chair.